This Sunday is Easter Sunday!! 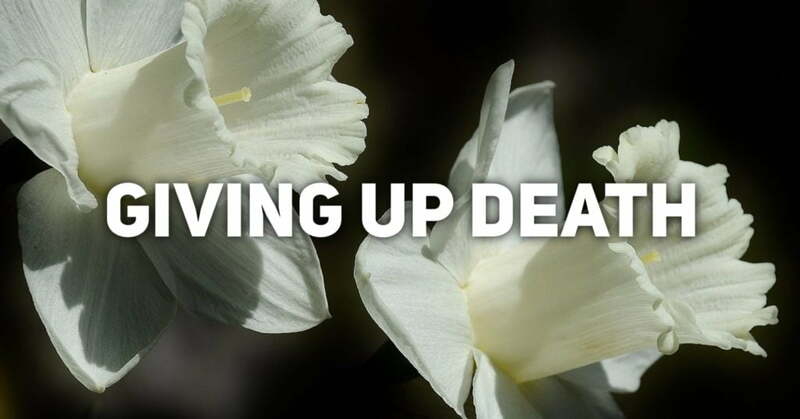 We conclude our Lenten series with the reminder that Jesus’ death and resurrection mean we are no longer subject to sin and death. In this freedom, we are called to live as people who are changed by this news. 1Early in the morning of the first day of the week, while it was still dark, Mary Magdalene came to the tomb and saw that the stone had been taken away from the tomb. 2She ran to Simon Peter and the other disciple, the one whom Jesus loved, and said, “They have taken the Lord from the tomb, and we don’t know where they’ve put him.” 3Peter and the other disciple left to go to the tomb. 4They were running together, but the other disciple ran faster than Peter and was the first to arrive at the tomb. 5Bending down to take a look, he saw the linen cloths lying there, but he didn’t go in. 6Following him, Simon Peter entered the tomb and saw the linen cloths lying there. 7He also saw the face cloth that had been on Jesus’ head. It wasn’t with the other clothes but was folded up in its own place. 8Then the other disciple, the one who arrived at the tomb first, also went inside. He saw and believed. 9They didn’t yet understand the scripture that Jesus must rise from the dead. 10Then the disciples returned to the place where they were staying. She replied, “They have taken away my Lord, and I don’t know where they’ve put him.” 14As soon as she had said this, she turned around and saw Jesus standing there, but she didn’t know it was Jesus. 18Mary Magdalene left and announced to the disciples, “I’ve seen the Lord.” Then she told them what he said to her. Does the resurrection of Jesus still have power today? Is it the same as it was when these disciples first raced to the tomb? If not, how is the power of the resurrection today? In the Gospel of John, Mary is the first disciple to see Jesus. She is also the first disciple to recognize Jesus and begin to understand his resurrection. Why might this be important? In the scripture from Acts, Peter seems to say that he is still learning about his faith (see Acts 10:34). What are you doing to continue to learn about your faith? The remainder of the Acts selection tells us about Peter’s response to Jesus’ resurrection. Read the entire story from Acts 10 (and repeated in Acts 11). How does this full reading impact how you treat people in your community?